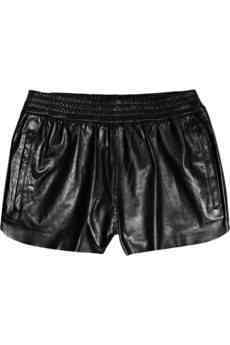 These leather shorts are from Maje, a really cool French line that you can get on Net-A-Porter.com. Net-A-Porter.com is my go-to for on-line shopping. They have everything you can ever want to be oh-so-fabulous in the dressing department. I paired the leather with a black tee from T by Alexander Wang, gray sweater from Comme des Garcons, and black flip flops from Louis Vuitton.